Home Not Our cup of tea! Not Our cup of tea! Glyphosate is poison. There are hundreds of cases of visible damage caused by it. In such a situation, the prior proof is not necessary. The proof should be sought after the ban. Take one point promoted in favour of glyphosate: it does not affect humans because of the absence of the shikimic acid metabolic pathway in the human body. The shikimic acid pathway exists in plants and some microorganisms. Glyphosate destroys it. The claim mentioned above may be a truth in regard to glyphosate and the human body taken separately, but it is not the truth in regard to the human body as a whole. Even the weak-minded know that the human body harbours billions of bacteria in the intestines. People who read know that certain actions of these bacteria support crucial brain functions. Glyphosate either kills or mutates bacteria. In fact, it was first introduced for that purpose. When bacteria in the human gut are killed by glyphosate ingested with food, certain brain functions are adversely affected. The ultimate effects are not even properly scientifically investigated but there is strong evidence that autism is one result. As well, there is strong visible evidence that traces of glyphosate in the body causes serious damage to fetuses – even causing miscarriages. Calling for definite scientific proof in connection with this visible evidence is inappropriate. Our science is nowhere near a complete understanding of human metabolism. It is nowhere near even having an idea of what kind of research needs to be done. Therefore it is nowhere near having the equipment and laboratory conditions required to replicate natural conditions and metabolism. Older people will remember the liquor ban in the USA with controlled releases. It was labelled ‘prohibition’. The law was broken with vicious abandon by gangsters. It led to machine-gun battles between the police and gangsters, to violent deaths and crime on a massive scale. In Sri Lanka, even now, the tea industry cannot control the ‘controlled’ release of refuse tea. It is being illegally obtained and distributed by several gangs. It is being exported too, seriously damaging the highly respected Ceylon Tea brand. This export racket has got so bad that the STF has been specially assigned to put a stop to it. Similarly, the authorities cannot control the illegal drugs trade and the kasippu trade. Do the authorities want a similar criminal problem arising from glyphosate? What is wrong with the tea industry? Is it being led by blinkered, uninformed, uneducated and unimaginative people? Why do they have such a deep yearning for glyphosate? Do not they know that in Turkey, the state-owned tea company, Çaykur, is prospering while our state-owned SPC and JEDB were buried alive by irresponsible, semi-educated, unprincipled political appointees and employees? The privately managed regional plantation companies are approaching a similar end. Our tea industry is 150 years old while the Turkish tea industry is only 97 years old. But Çaykur, based in the Rize region of Turkey, with nine regional directorates, has 75,900 hectares (187,500 acres) of cultivated tea under its command. It has a turnover of US$ 700 million. It produces 133,000 TONS of made tea, both black and green (133,000,000 kg). It gives employment to 10,670 persons. It has a small-holder population of 207,000 as sole suppliers of green leaf. Çaykur also has 46 factories and two packaging plants. How well could our 23 regional plantations taken together, or the smallholders taken together, be compared with Çaykur? Very poorly, from the point of view of profitability, management, production, dedication and whatever else. Consider just a few important points related to Sri Lanka tea industry. The language in Çaykur website is simple and highly expressive of the deep genuine love of tea. Their god is tea. Ours is money? They say: Only a few countries are as closely connected with tea as Turkey. We want to export Turkish tea culture to the world. After all, for us, tea is more than just a drink – it is happiness, passion and the future. We want to be better than we already are. Quality assurance is very important to us. Tea farmers and their families are the backbone of our business. They work for us and we provide them with secure jobs and pay them well. We want everyone to be satisfied: both the producers and the consumers. These sentiments strike deeply, not so with our high-pressure marketing language. The need to go organic. It is recognised and a plan is meticulously followed to achieve it and preserve the people and their habitat. By 2023 Çaykur will have all 75,900 hectares in organic tea. They say: We are part of nature. We do not want to use any chemicals that might endanger nature or humans. We want Rize to become the largest organic tea-cultivating region in the world. By 2023, the entire production will be converted to organic farming. In this way, we will not only be producing naturally aromatic tea but will also be securing the future of Rize residents and their natural environment. We, on the other hand, are dead set on poisoning the consumer. We over-apply fertiliser that has toxic heavy metals, we apply insecticides and we cry out to use Glyphosate. We will never go completely organic considering how desperate the industry wants Glyphosate. 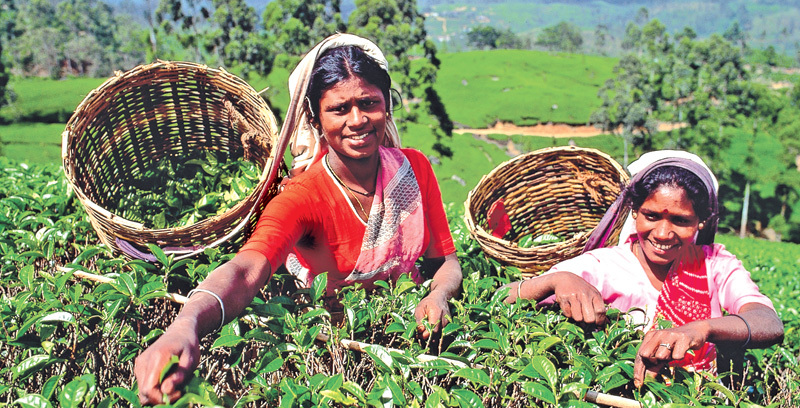 The proud and respected brand Ceylon Tea will be eventually vilified and rejected by consumers. This debacle will occur much earlier than expected because of electronic social media. A good example was how the voting pattern was affected at the last presidential election. There is no doubt at all that the consumer is going for organic tea and wants to verify the origin too. Çaykur has canned tea for iced tea. Do we? We have beer in cans. Why not tea? Why not cash in on the Ceylon Tea brand? There are plenty of other options for advancement in the products range. Çaykur says: Tea farmers and their families are the backbone of our business. They work for us and we provide them with secure jobs and pay them well. We want everyone to be satisfied: both the producers and the consumers. We cannot expect our workers to live on wages that do not match living standards in the country. Whatever the wages are in other countries, especially so without even a guarantee of daily work and while remaining as workers for generations. For an enterprise to succeed, the workers must be adequately paid or provided with another income avenue. Çaykur is supplied green leaf by smallholders. A similar arrangement is being carried out by Dilmah. Such an arrangement would improve production too. The lessees need not be estate workers only. Genuine farmer families should be selected and their overall output and maintenance examined regularly and closely and maintained without fear or favour. Authorities should not shilly-shally in carrying out changes that are unpleasant to some. Preserving the vote bank is not the priority. The country and people are. The Çaykur CEO of says: When I was young, I had to pick every single leaf by hand. Now, using shears, a good picker can harvest up to 500 kg. Unbelievable but true. The CEO says so. Our per capita production by hand is a pathetic average of around 18kg/day. This is less than half that of a Kenyan worker (48kg) and is only two-thirds of that of a South Indian worker (27 kg). This is highway robbery promoted by politicians. It must be stopped, kindly and firmly. The Turkish method of using shears must be investigated. Using this method could result in the collection of pieces of mature leaf too, but they can be sorted out just as damaged green leaves are sorted out even now. The waste leaf can be profitably used too. As the worker and the tea bush get used to the Çaykur plucking method the percentage of mature leaf in the pluck will diminish. It is worth taking two or three reliable men and women pluckers under a bond to Turkey to learn the process. The Planters’ Association is crying out for an increase of just 2 kg in the daily plucking output to show profit. Here is a chance to do very much better. This ensures instantaneous recovery at low cost. After achieving much better production, the new more productive seed tea must be planted. They can be made to get about 40 percent of their nitrogen fertiliser as legumes do – cutting costs. The use of chemicals must be completely overhauled. Weeds can be controlled by other methods. It can be done without RoundUp or worse chemicals being tested by the TRI. Continued use of RoundUp will boomerang on us and we will be faced with a worse fate than that suffered recently due to a sluggish market. The tea industry can collapse. Two million livelihoods and the custom of billions are at stake. Chemical Fertilizer application method must be changed. Pest control must be carried out with care and within limits. The following can be done without much of an outlay. They help to increase profits and in cost cutting too. Controlling erosion but not with ditches along contours. A permanent solution, unlike ditches, is required. Weeds should be controlled without chemicals at least in three ways. Nitrogen should be provided while preserving soil moisture. Getting best results from fertiliser and using less - by avoiding it getting washed away - thereby preserves the environment and does not pollute the waterways. It greatly increases gliricidia production for biomass fuel, without increasing land use. Growing high-value, high demand short-term crops on unused land is also a necessity. Factory automation should be given proper attention. It gives better uniform quality tea fetching premium prices. Power generation from tea wastes – both green and black, supplemented with other wastes – should be attended to. There will be plenty of power for export too after in-house needs are satisfied. The process will be cheaper than mini hydro and have two other income streams too.